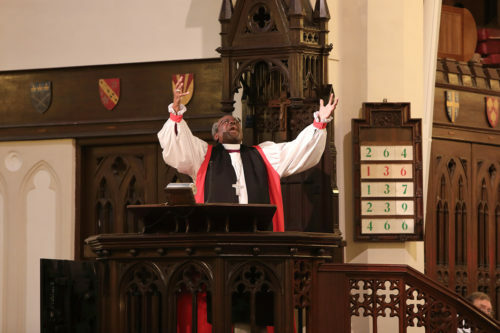 [Episcopal News Service – Hong Kong] On Presiding Bishop Michael Curry’s first official visit to the Anglican Province of Hong Kong Sheng Kung Hui, he discovered that the Christian church in Hong Kong and the rest of Asia is growing, and it reinforced his belief that relationships centered in the gospel are essential to missional partnerships. “Christianity is growing here, Anglicanism is growing here in Hong Kong. … Hong Kong is a critical relationship in being in real relationship with Asia, and it’s clearly a relationship of equals and that becomes a model or a template for other relationships as well,” said Curry. Curry spent two days in Hong Kong; the second stop on his first official visit as presiding bishop and primate to Asia and Southeast Asia that also included the Philippines, China and Taiwan. Peter Ng, the Episcopal Church’s officer for Asia and the Pacific, now retired; the Rev. Charles Robertson, canon to the presiding bishop for ministry beyond the Episcopal Church; the Rev. David Copley, director of global partnerships and mission personnel; Neva Rae Fox, the church’s public affairs officer; and Sharon Jones, executive assistant to the presiding bishop, accompanied Curry. It was Hong Kong, said Robertson, that set the example for becoming an independent province outside colonial rule. “And they quickly became a leader,” he said. Hong Kong, which became a special administrative region governed by China in 1997, was a longtime British colony. The first colonial chaplain was appointed in 1843. The Diocese of Victoria was created in 1849 and later became part of the first national church organization in China. In 1951, following the formation of the People’s Republic of China, the then-Diocese of Hong Kong and Macau became a detached diocese. It became an independent Anglican province in 1998. Its partnership with the Episcopal Church dates to the 1940s and ’50s, said the Most Rev. Paul Kwong, archbishop of the Province of Hong Kong Sheng Kung Hui, in a Feb. 20 interview with Episcopal News Service. 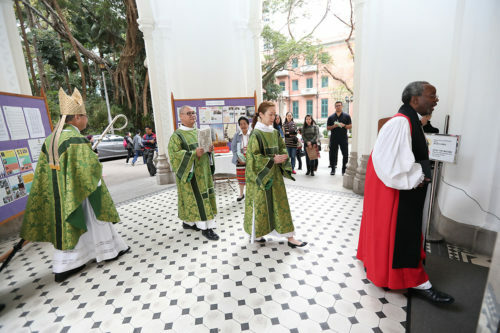 The partnership has included companion diocese relationships, and the Episcopal Church helped to build churches in Hong Kong and Macau in the early years, he said. “So, we’ve had that link for a long time,” he said. 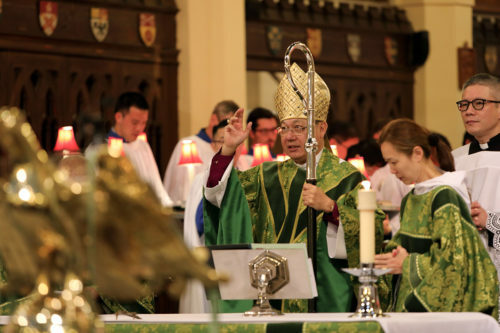 The presiding bishop’s visit, Kwong said, was significant in that it served to strengthen the link between the Hong Kong Anglican Church and the Episcopal Church. But the presiding bishop’s visit also was significant in that Curry is new to his primacy and it brought together two primates, said Kwong, who in was elected chair of the Anglican Consultative Council in April 2016. “Over the years, the Communion has been deeply divided and impaired by some contentious issues, and the Episcopal Church has been at the center these arguments and division,” said Kwong, referring to the 2003 ordination and consecration of now retired New Hampshire Bishop V. Gene Robinson as the first openly gay bishop in the Episcopal Church and 78th General Convention’s canonical and liturgical changes in 2015 to provide marriage equality for Episcopalians. It’s time, said the archbishop, to shift focus to mission and to ask, “What is the Communion for? How can we make our communion relevant in our own contexts and to the world at large? 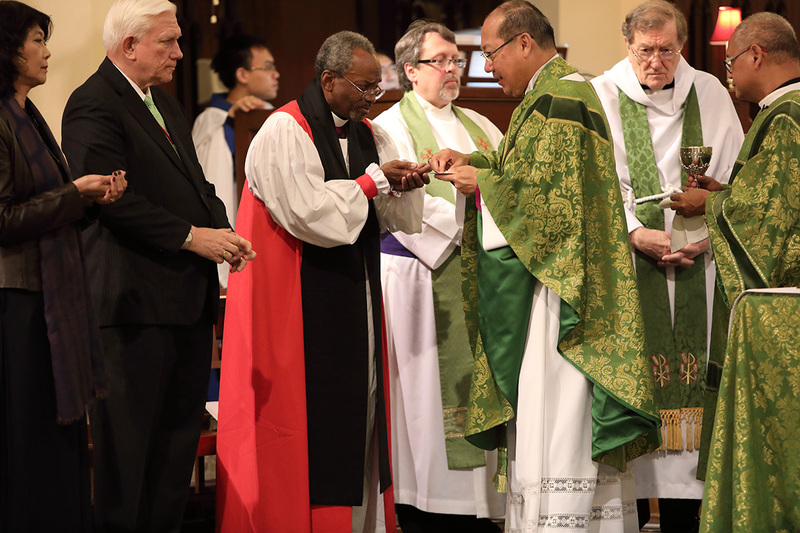 Curry’s message, rooted in what he calls the “Jesus Movement,” underscores the Episcopal Church’s focus on mission partnerships, Kwong added. “His message has demonstrated very clearly that the Episcopal Church has a very strong sense of mission and evangelism, and homosexuality isn’t the only issue the church has to address, even though it’s a very serious issue that no one should ignore. … The message about the Jesus Movement and reconciliation is very significant to the communion. “In his sermon yesterday in the cathedral he passionately indicated that God has a dream for every one of us, every church and particularly for the communion. I’m sure that God’s dream is for us to reconcile to each other and that we should work together in unity for the common good. Curry brought his fiery Jesus Movement message to a standing-room-only crowd that overflowed into the courtyard of St. John’s Cathedral in the heart of Hong Kong’s central business district. It was a message that David Xia, who studied Anglicanism in England, traveled more than three hours from Shenzhen, across the border with mainland China, to hear. A message that he said impressed him because of the presiding bishop’s passion and his humility. Following the Feb. 19 Eucharist, Der gave a presentation about the Province of Hong Kong’s history and ministry to the presiding bishop and his staff. The Province of Hong Kong Sheng Kung Hui includes the dioceses of Hong Kong Island, Eastern Kowloon, Western Kowloon and the Missionary Area of Macau. Some 30,000 people worship in about 40 congregations and mission points, served by more than 70 clergy members. The province operates social service ministries, including its prison ministry, mental health and elder care ministries, its mission for migrant workers and its program to assist domestic workers. Many migrant workers from Indonesia and the Philippines work as domestics in Hong Kong. Many Filipinas, from the Episcopal Church in the Philippines, the Philippine Independent Church and the Roman Catholic Church, worship at St. John’s Cathedral, which holds eight weekend services in four languages – English, Mandarin, Cantonese and Tagalog — for more than 2,000 people, 65 percent of them from the Philippines. The Province of Hong Kong has grown 40 percent over the last decade and has 50 parishes, 140 schools and 400 social service units across Hong Kong and Macau, said Der. Click here to watch a video of the presiding bishop preaching at St. John’s Cathedral on Feb. 19.